Don’t just warn the kids – make sure your kids follow the safety rules this Halloween! 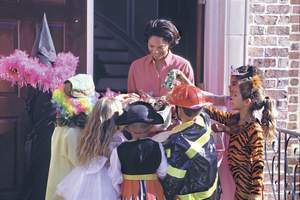 From candy to costumes, parents set the example when it comes to safety on Halloween. (NC)-It’s easy to get caught up in the fun of Halloween – in fact, planning out costumes and decorations often starts early, and by the time it’s time for Trick-or-Treat, it is all that kids can do to keep from bursting with excitement. While Halloween is certainly about fun, it’s also about safety – and parents need to take the lead when it comes to ensuring the safety of both their kids – and others – on Halloween night. Be wise with your candy purchases. Give some thought to the candy you choose to hand out. With a growing number of children suffering from severe food allergies, including peanut allergies, consider a peanut-free treats bowl where snacks like Mars Peanut-Free bars can be given out to trick or treaters. Read labels and ingredient lists carefully – products that “may contain traces of peanuts” should be avoided. Be responsible with your child’s costume. Makeup is more fun than a mask and allows for better visibility at night. Costumes should be easily seen in the dark, and should be short enough to avoid tripping hazards. Plan your route ahead of time. Have your child help plan your route before you step out the door. They’ll love being involved, and having a plan will help you restrict the route to a well-known area. Revisit the rules of the road. With all of the excitement, it’s easy to forget to look left and right before crossing the street. Be sure your children know the different traffic signals and when it is safe for them to cross – and to always wait for cars to come to a complete stop before crossing. Keep your house free of safety hazards. Clear your walkway of toys or other tripping hazards for the little ghouls and goblins that will be visiting your home. Halloween decorations can add spooky ambiance, but make sure they don’t block lights or obstruct visibility. Halloween is no doubt an exciting time in a child’s life. Be sure to keep these tips on hand to ensure a safe night of ghoulish fun for everyone.